In my previous post, I failed to give any information about our port. 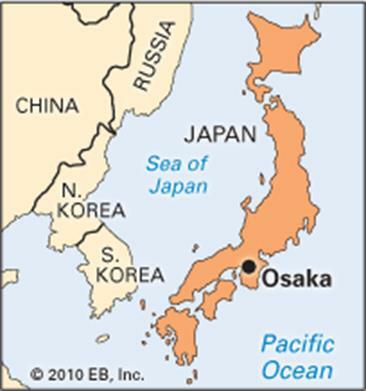 Osaka is located on the main island of Honshu, roughly in the center of Japan. 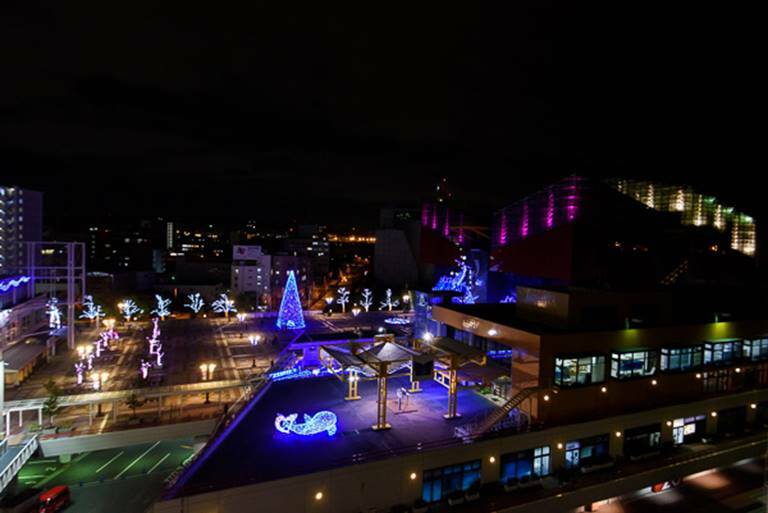 Osaka City, which was incorporated in 1889, has a population of 2.5 million and an area of 221 square kilometers. 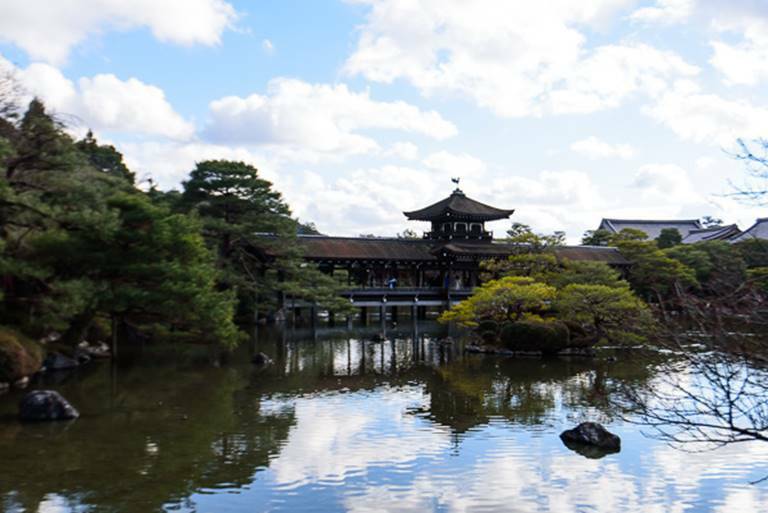 Osaka Prefecture, which includes Osaka City (its capital) and 42 other municipalities, has a population of 8.7 million and a total land mass of about 1,905 square kilometers. 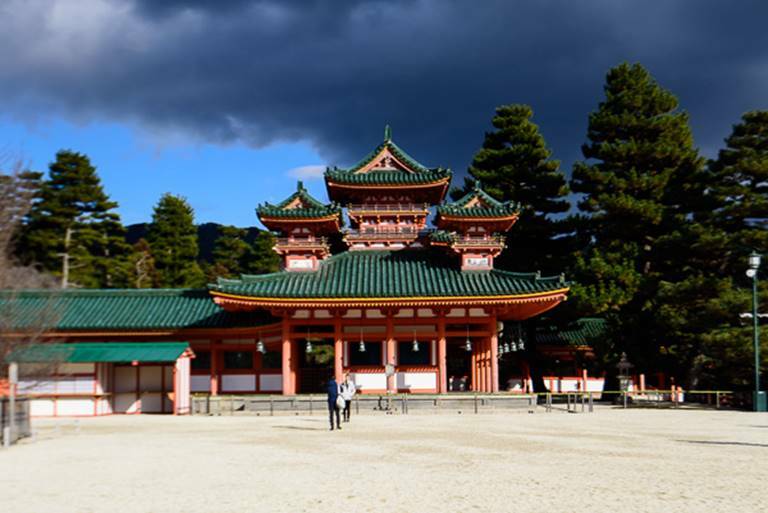 Although Osaka is Japan’s second smallest prefecture by size, its population represents 7% of the entire nation, making it the second most populous prefecture after Tokyo. 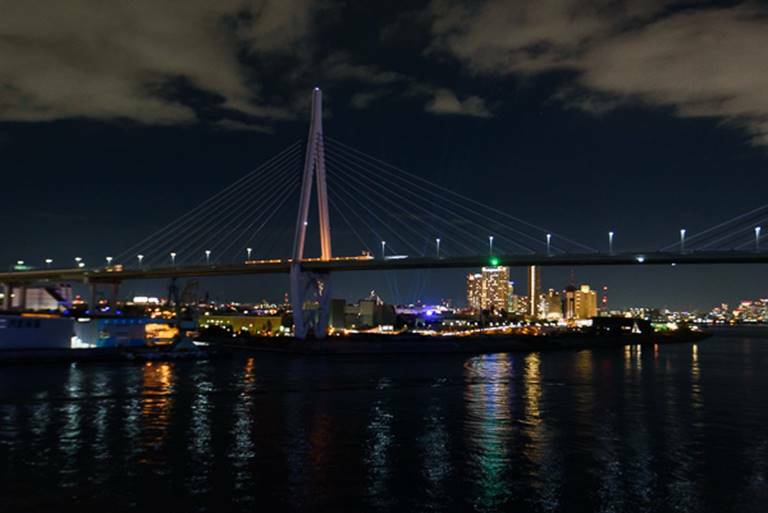 Furthermore, 10% of all non-Japanese residents live in Osaka. Osaka is a major metropolis and as such is not one of my favorite ports. As my regular readers know, I much prefer the smaller out of the way, non-tourist areas. 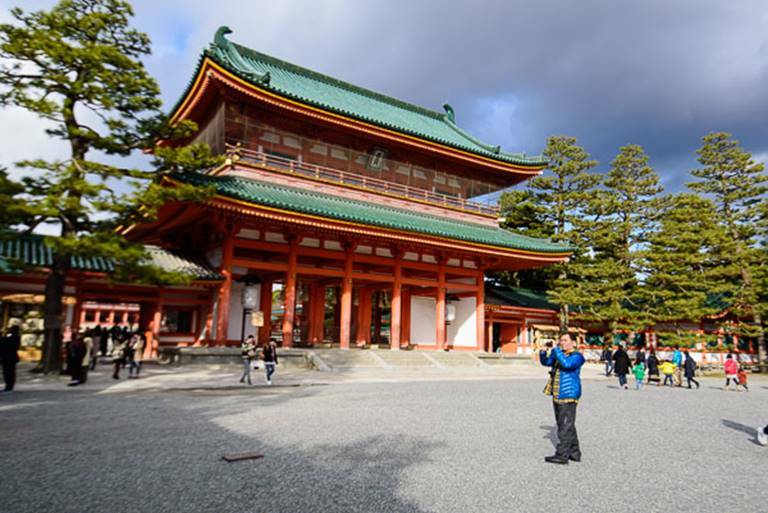 Nevertheless, we did visit some interesting locations outside Osaka City. Byodo-in Temple built in 1053. The Phoenix Hall which on the 10 yen coin. 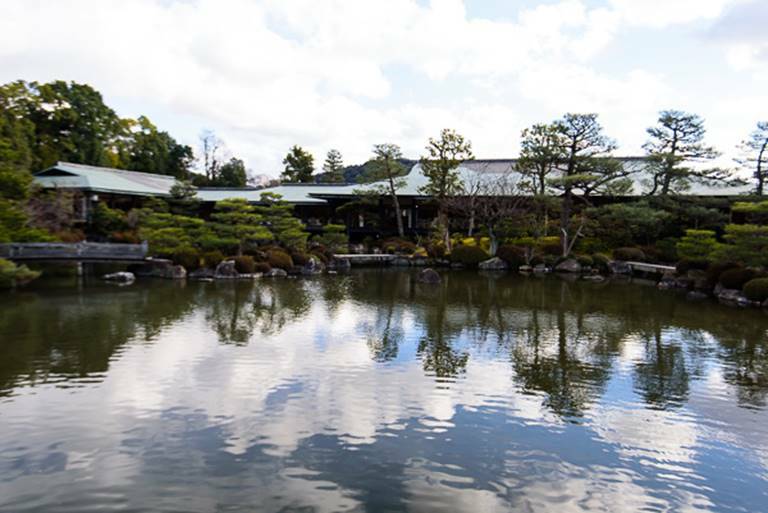 Our next stop was Gikkikan Okura Memorial House, the largest of Fushimi’s sake breweries. 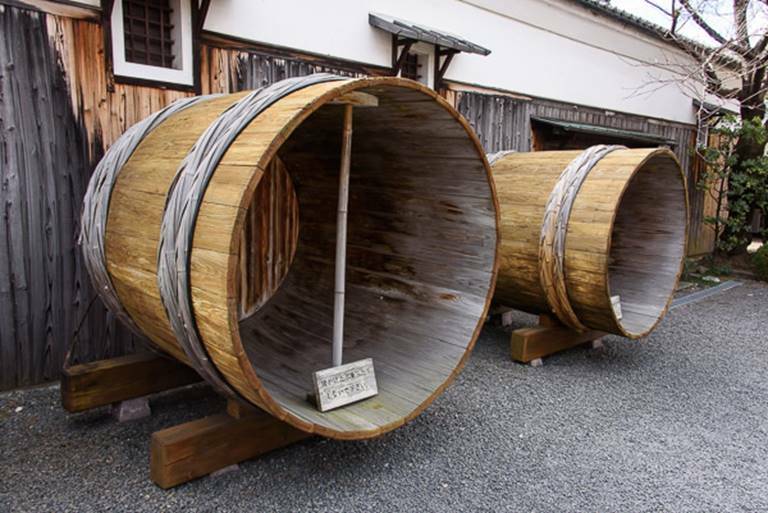 These large barrels are made of Cypress wood – it would never work for Jack Daniels! We were able to sample several varieties of sake. Some I liked, others not so much. 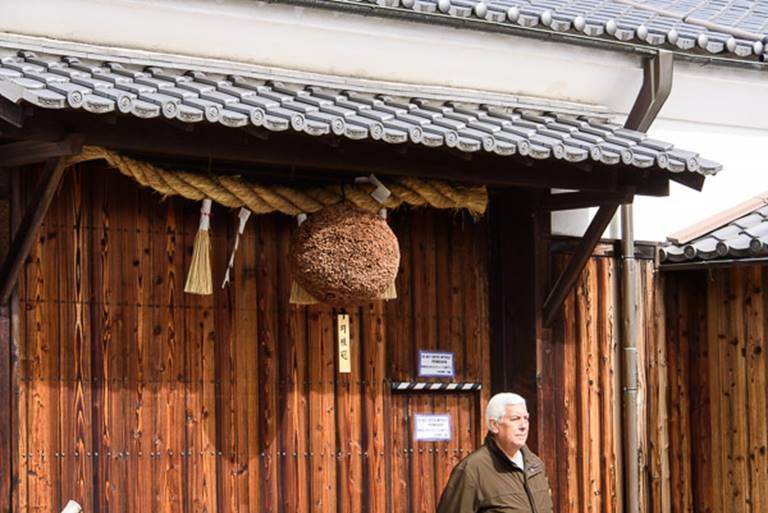 By tradition, a large ball made up of cypress needles is hung when a new batch of sake is started. As it turns from fresh green to darker brown, it is an indication that the brew is nearing completion. 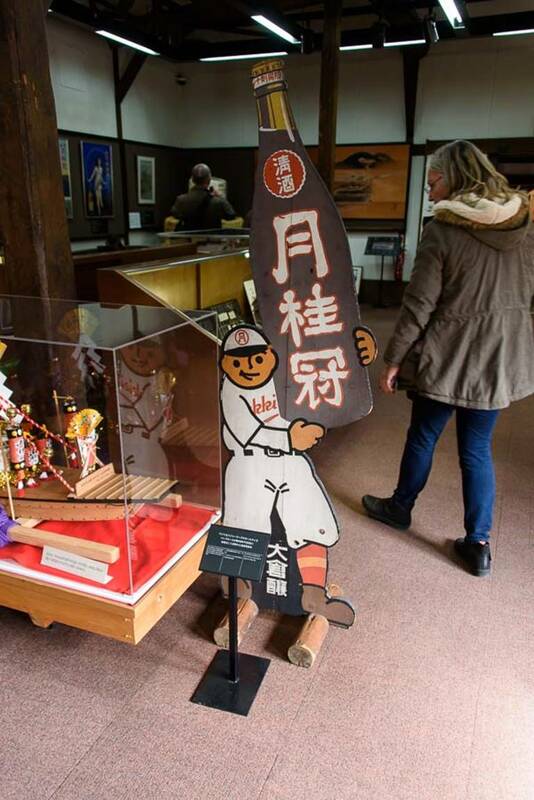 An old advertising sign in the museum. Space in the cities is scares. 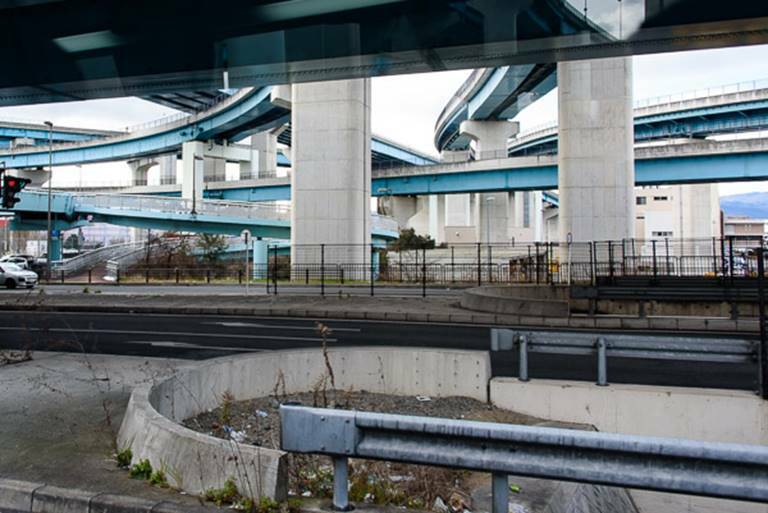 Freeways almost always go up rather than spread out. Sometimes it seemed there were layers upon layers of traffic. Even under the freeways, the space was used for storage and parking. In less urban areas, all the land right up to the freeway was under cultivation. 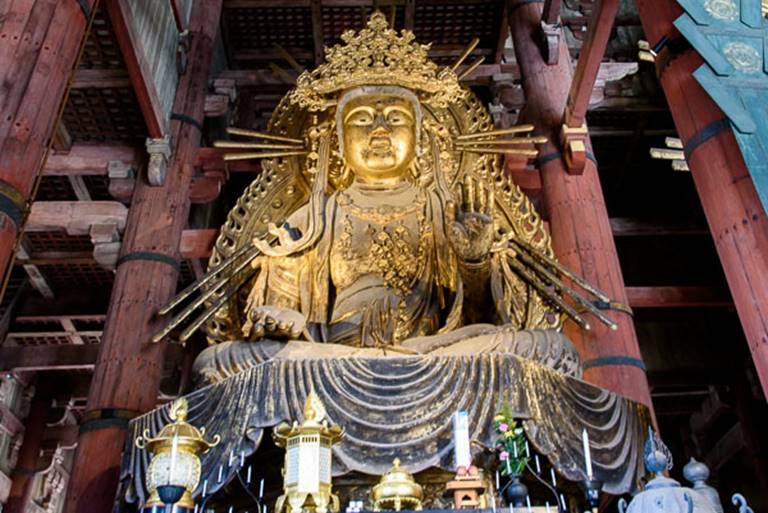 At the Todaiji Temple and the Hall of the Great Buddha is the bronze statue of the largest Buddha in Japan. 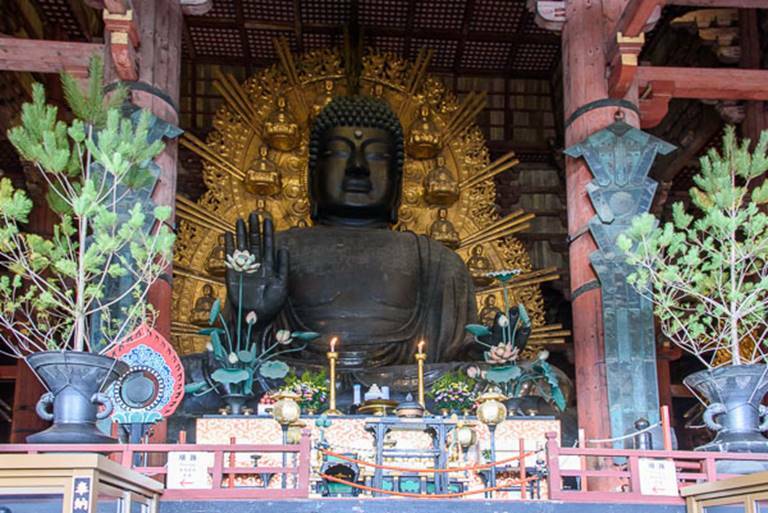 It is a sitting Buddah which stands almost 50 feet tall. 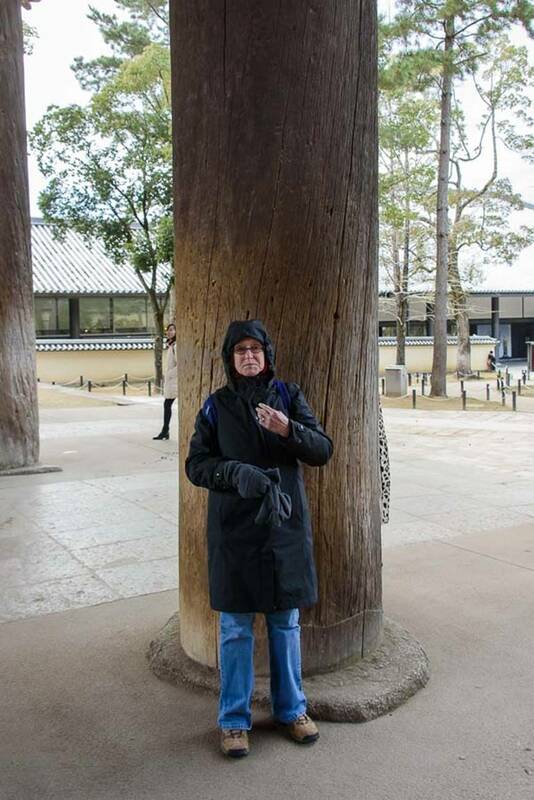 Kay beside one of the 1500-year-old timbers supporting the structure. She really wasn’t that ill, she was just cold! 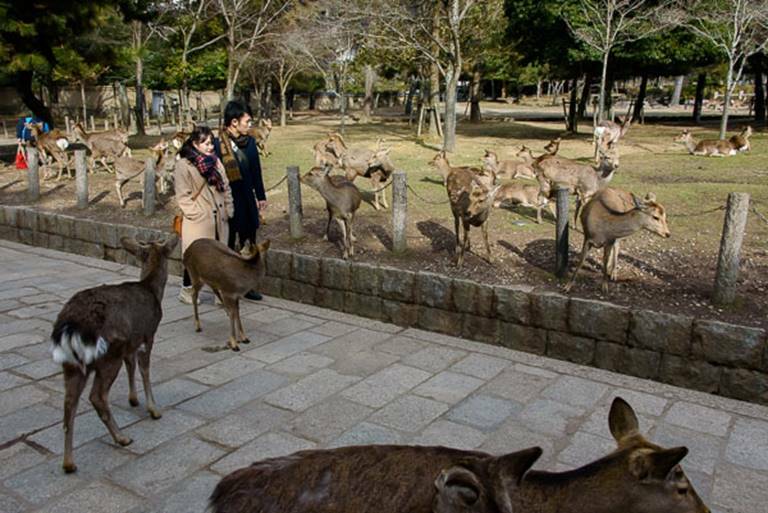 Over a thousand deer run freely on the grounds. Considered sacred, they have become completely tame to humans. 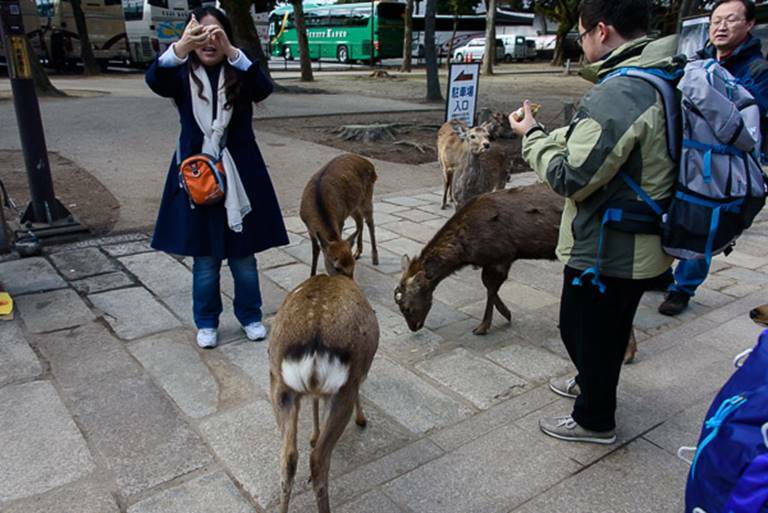 They beg for food by doing like any polite Japanese they bow. Really! The herd is maintained at about 1200 animals. The antlers are trimmed to reduce injuries to visitors. 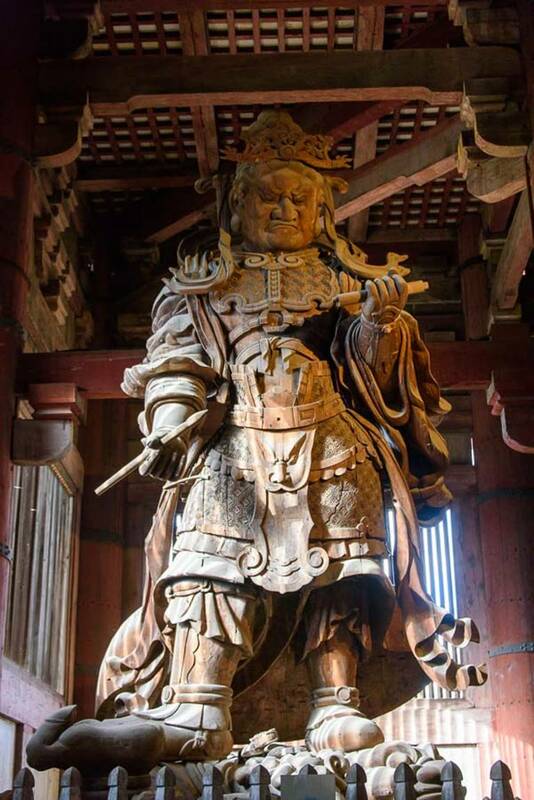 A huge wood carved gardian. 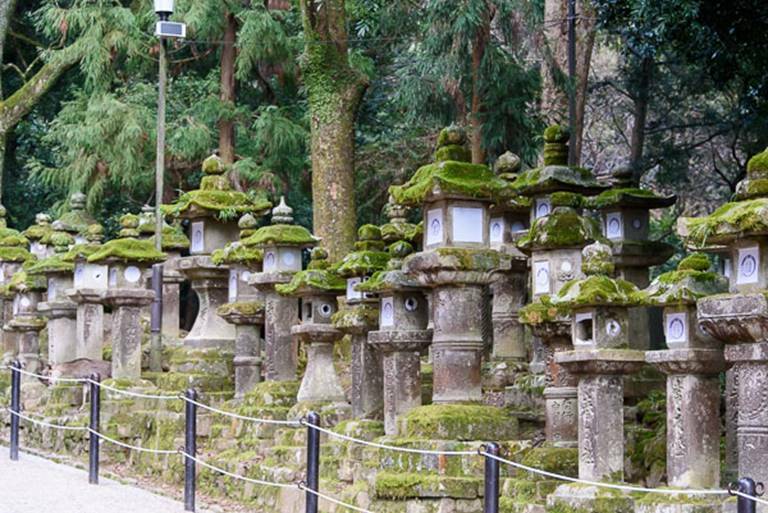 A few of the 3,000 stone lanterns which line the road east from the second tori gate to the Kasuga Taisha Shrine, a Shinto Shrine founded in 710. Back at the ship, nightfall was arriving. This view is from the Amsterdam’s bow. 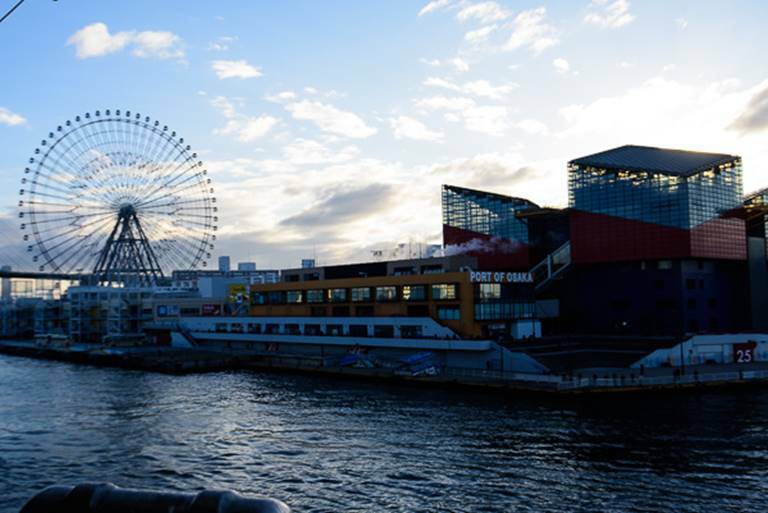 The view from the stern of the Kyoto Aquarium and surrounding area. The Wheel was beautiful. It’s lighting was computerized and revealed many stories. I loved the smaller fishes being chased by a larage fish across the wheel. I did get a video of this, but it takes too much bandwidth to upload. Although I enjoyed my first two days in Japan, they were quite tiring. 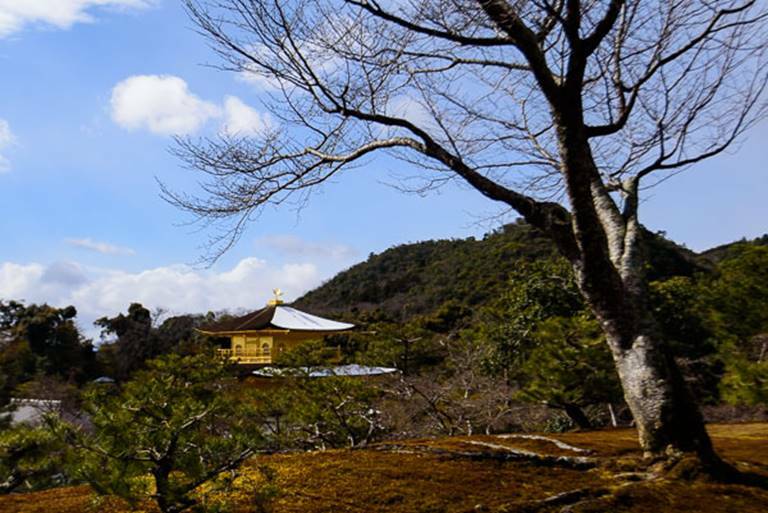 I have seen enough temples and shrines for a while. I am looking forward to Kagoshima, where we will visit an active volcano. We will have a Valentines Ball tomorrow night, a sea day and arrive at Kagoshima on the Wednesday the 14th. It has been several days since my last post. 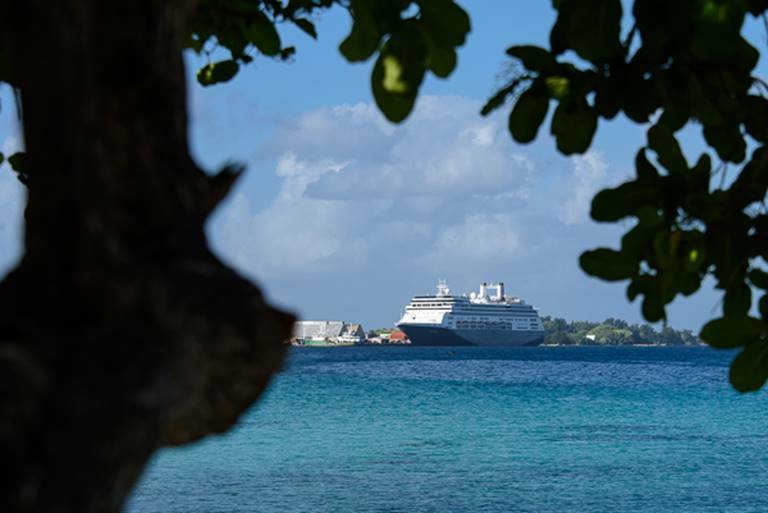 Due to the cancellation of port call in Saipan, Northern Mariana Islands on the 8th, we have had four consecutive sea days (but it seems much longer!). Since leaving Honolulu we have had 11 sea days out of a total of 13 days. We arrived in Osaka, Japan this morning at 8:00 AM. We did have to go through immigration and customs, but like everything else with the Japanese, it was very organized and timely. 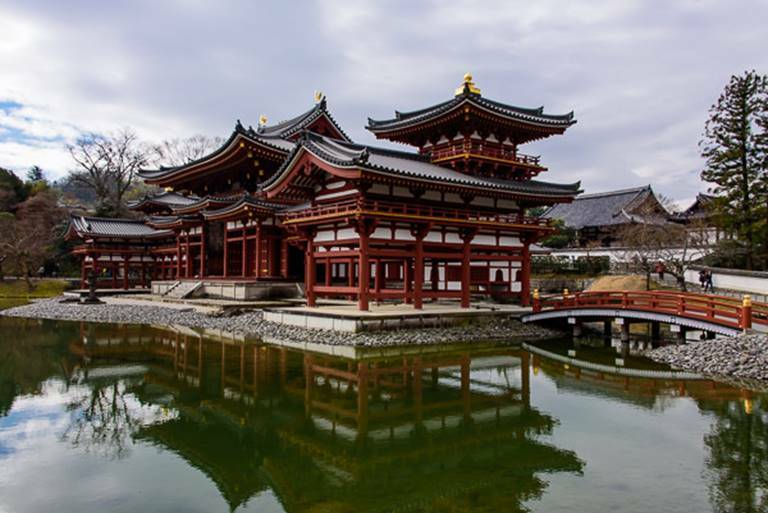 We boarded our coach for the 1.5 hour trip to Kyoto City where we spent most of the day visiting numerous Buddha shrines and Shinto temples and Shogun castles. We did experience some snow today. It was a shock to our systems to go from mid 80 degree temperatures earlier in the week to mid 30 degree temps and snow today. I apologize for not having much commentary, but after an almost 10-hour trip plus customs clearing this morning, I am quite fizzled! Our wonderful dining room manager assured us that he would hold our table as long as needed until we arrived and he did. Having someone like Presty to look after you is a blessing. It was so nice to sit down to a beautiful relaxing meal and a couple of glasses of wine. 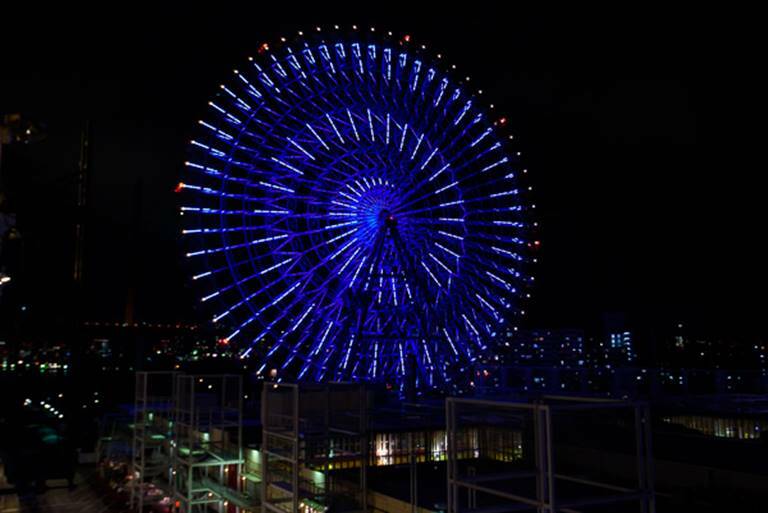 The port of Osaka, a very inviting wheel! The last few days have seen some strong winds. The captain reported winds in excess of 60 mph during the night with waves cresting over 20 feet. We were awoke several times during the night but went right back to sleep. 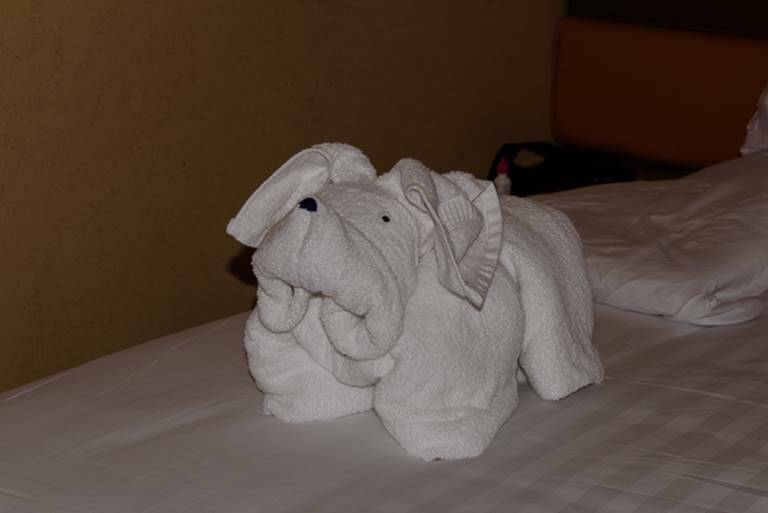 Our room attendants, Mos and Echo have provided us with lovely towel animals. This one reminded me of our wonder bullmastiff, Mack. 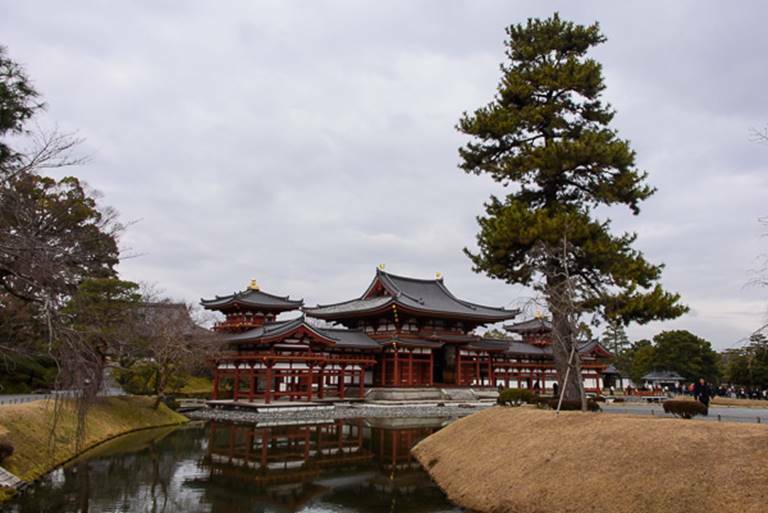 I will close now, our plans for tomorrow are even longer—we are doing a 10 + hour excursion to Nara for more temples, shrines and an active volcano! I would like to wish our grandchildren, Polly and Camden Happy Birthday. They both turned four this week. We hate we weren’t there to celebrate with you, but will see you soon after our return. Also, for my Soleil Weather watchers, as you have noticed, the weather site is not updating since the power outage last week. I have tried unsuccessfully to reset it from here, but with no luck. It might have to wait another couple of weeks till our return. 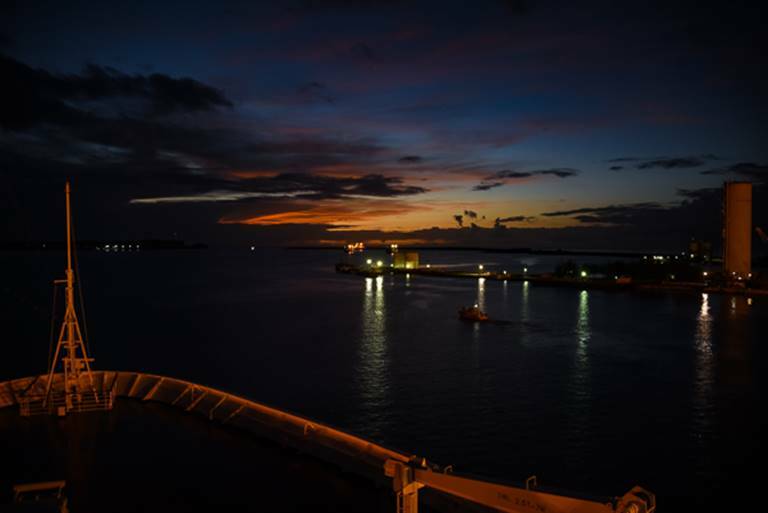 After another four days at sea, we finally reached our second port, Guam. Our start wasn’t exactly smooth. 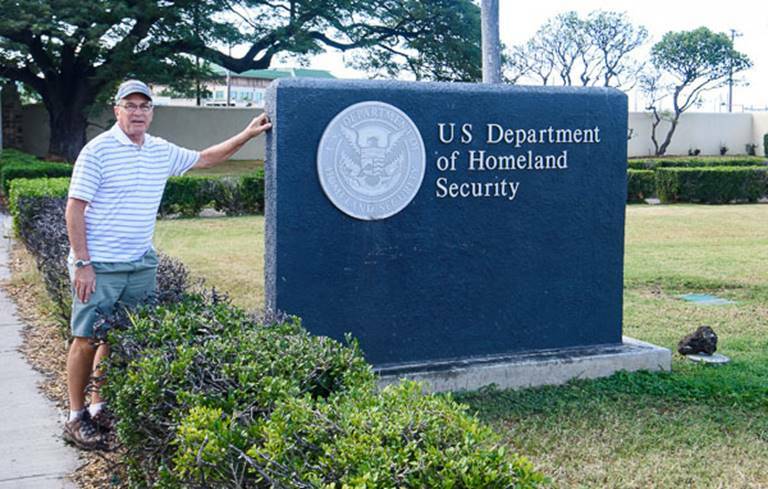 Guam, officially being a part of the U.S., requires a full customs and immigration procedure. We were scheduled to be portside at 8:00 AM, which we were. Immigration clearance was supposed to begin at 7:45. The custom officials were here but It was after 9:00 AM before the immigration officials arrived. This resulted in over an hour of cooling our heels. I don’t mind the face to face immigration procedure, if fact I welcome it although it sometimes is a pain. The captain announced that due to the immigration processing delay, we would delay our sailing from Guam by two hours. This means a 7:00 PM departure. It is the largest and southernmost island in the Mariana Islands archipelago. It lies about 5,800 miles (9,300 km) west of San Francisco and 1,600 miles (2,600 km) east of Manila. 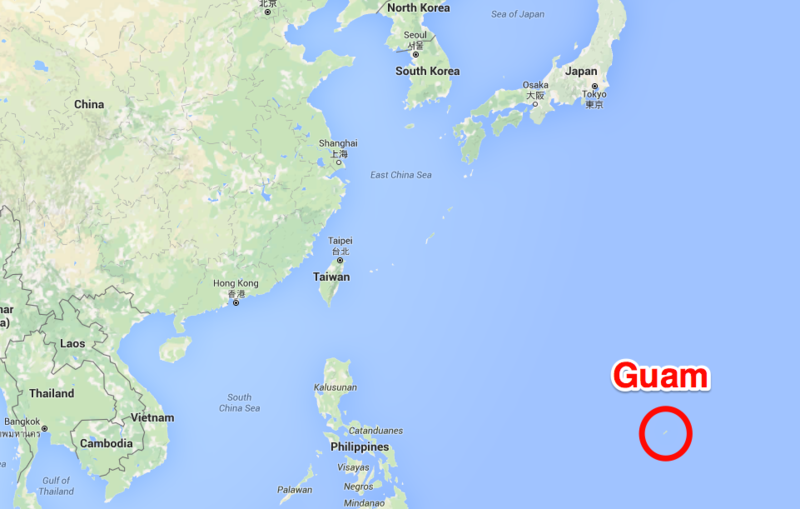 Guam is a territory of the United States of America. It is considered to occupy a militarily strategic location, south of the Commonwealth of the Northern Mariana Islands. Guam is one of many islands that make up Micronesia, which politically consists of Belau (Palau), the Federated States of Micronesia (FSM), Kiribati), the Marshall Islands, and several remote islands designated as the US-administered islands of the Central Pacific. All of Micronesia has close political ties to the US. I have included additional information about Guam which I extracted from several sources. I realize most of my readers might not be interested in this “background” information so feel free to skip to the photos! The ceding of Guam to the United States as an unincorporated territory after the Spanish-American War in 1898 introduced Chamorros to democratic principles of government and the modern American lifestyle. 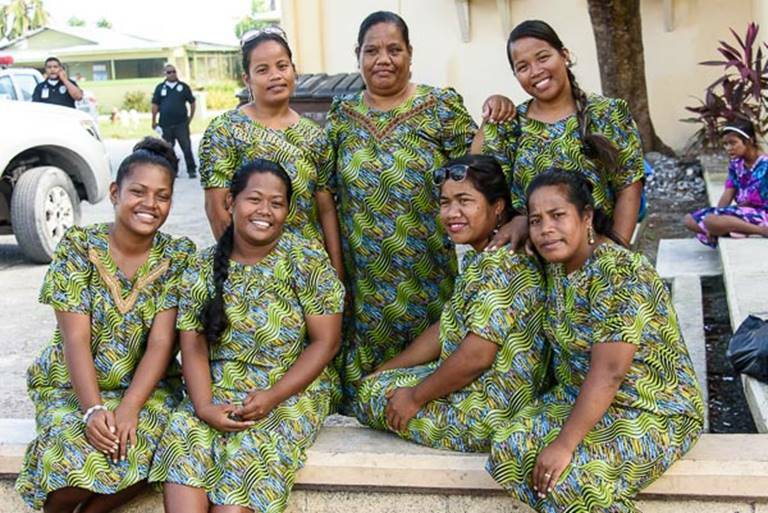 Native Guamanians, ethnically called Chamorros, are of basically Malayo-Indonesian descent with a considerable admixture of Spanish, Filipino, Mexican, and other European and Asian ancestries. Chamorros and other Micronesians constitute about half the population. Nearly one-third of the people are Asians, notably Filipinos and Koreans, and there is a small minority of people of European ancestry. About three-fourths of the people are Roman Catholic, and one-eighth are Protestant. 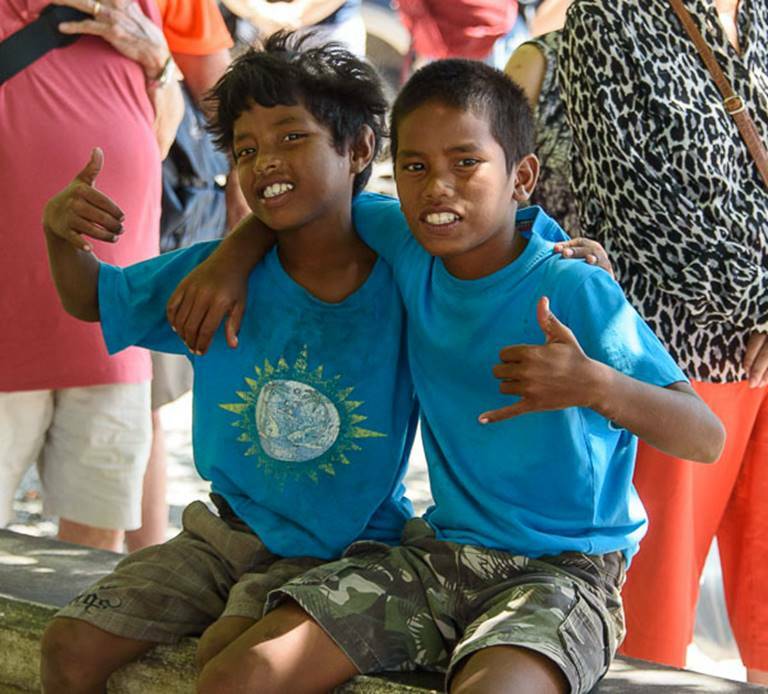 The Chamorro language is an Austronesian language that has, over time, come to incorporate many Spanish words. The word Chamorro is derived from Chamorri, or Chamoli, meaning “noble.” English and Chamorro are the official languages; although Chamorro is still used in many homes, English is the language of education and commerce. 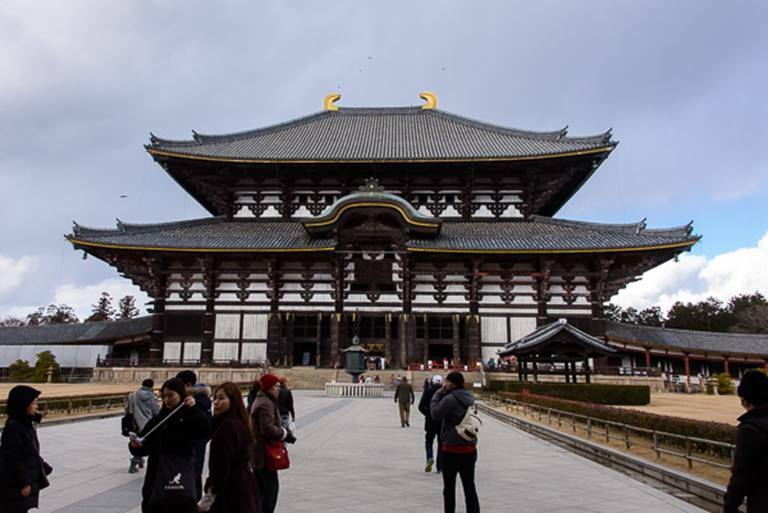 Because of the number of tourists and investors from Japan, Japanese is increasingly also used. The island’s rate of natural increase, although about average for the region, is high compared with that of the United States, partly because of a low death rate. 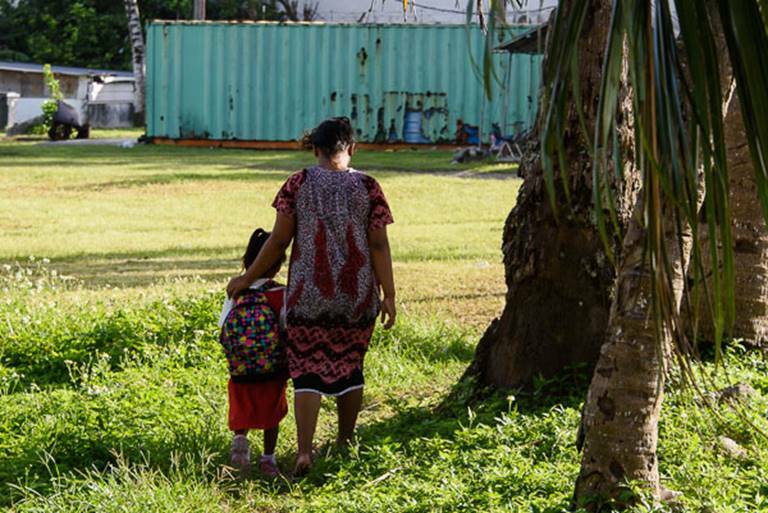 There are large numbers of migrants from the Philippines and South Korea, as well as from neighboring states such as the Federated States of Micronesia, Palau, and the Republic of the Marshall Islands. 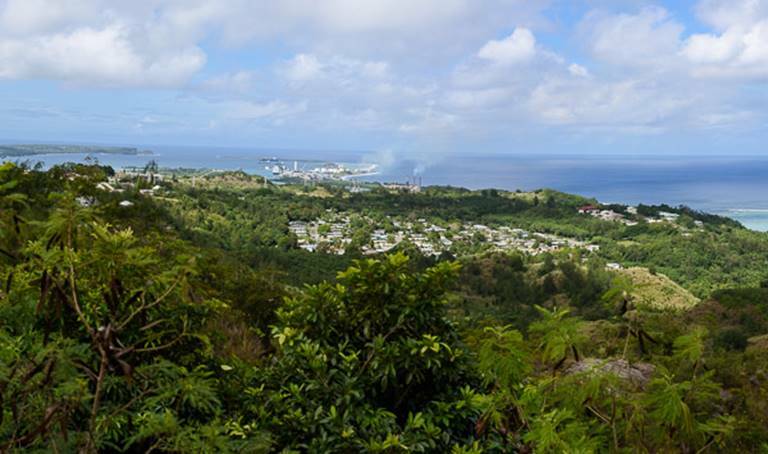 The development of Guam into an important U.S. military base brought about profound changes in the island’s agricultural patterns after World War II. Foodstuffs were imported in increasing amounts at the expense of local cultivation, and Guam now imports most of its food. 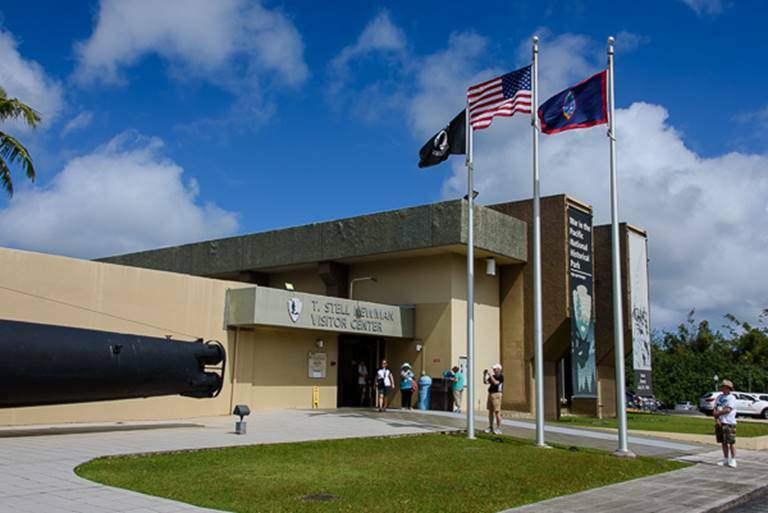 The U.S. armed forces are represented at multiple military facilities on Guam. Andersen Air Force Base and its annexes are concentrated at the northern end of the island. U.S. Navy facilities, located around the island, include a naval air station, a naval base with a ship repair yard, communications centers, and a hospital. Work at the military facilities has drawn many islanders away from their former lives of subsistence agriculture and fishing. Tourism is the most prominent component of the economy, with more than a million visitors arriving per year. There are several luxury hotels along Tumon Bay, which has been highly developed as a tourist area. An international airport links Guam with other Pacific islands, Asia, and Hawaii and the continental United States. Poultry farming, garment-finishing plants, and oil refining are important earners. 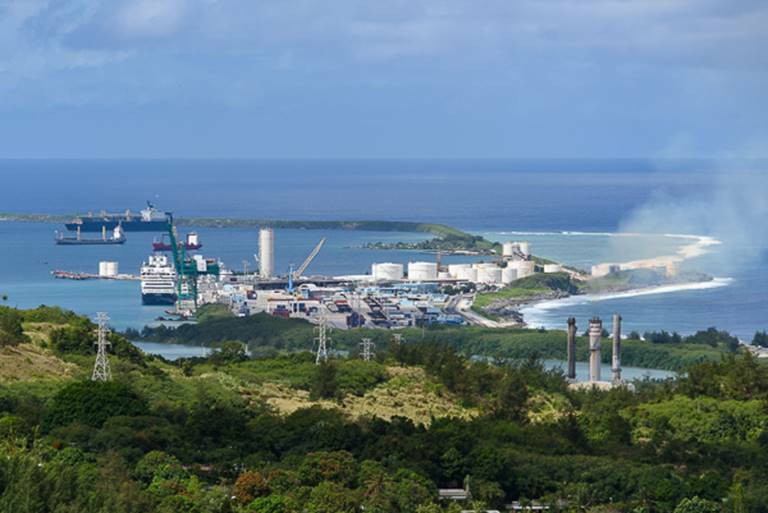 Guam is a duty-free port, and this status has attracted several small manufacturing companies from countries in Asia and has also prompted some immigration. Major imports—mostly from the United States and Japan—include food products, motor vehicles and parts, and shoes and other leather products. The leading exports are motor vehicles and parts, fish and other food products, scrap metal, and tobacco products. Finland, Japan, and the Federated States of Micronesia are the main export destinations. Guam is culturally diverse, with Chinese, Japanese, Filipino, Korean, and other Asian communities of significant size in addition to its indigenous population and people from the mainland United States. 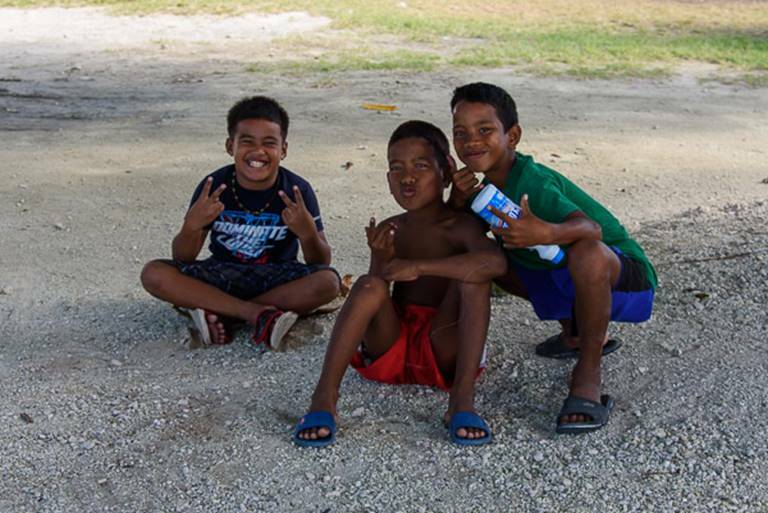 As a center of transportation and communication for the region, it also attracts many islanders from various parts of Micronesia. A large American-style shopping mall in Dededo, the Micronesia Mall, is the largest shopping center on the island and also serves as a cultural and recreational venue, with movie theatres and an indoor amusement park. Before World War II the villages were the main social and economic units, preserving customs and traditions similar to those of 19th-century Spain. Fiestas held in commemoration of patron saints were great social and religious events of the year for each village and brought together people from many parts of the island. Fiesta customs are still observed in Guam. 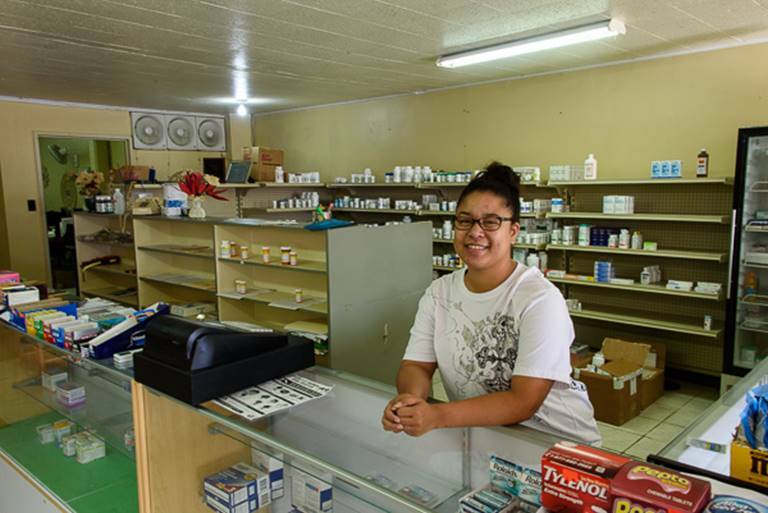 However, changes in the social life and institutions of Guamanians have come about with economic development and increasing international contacts. 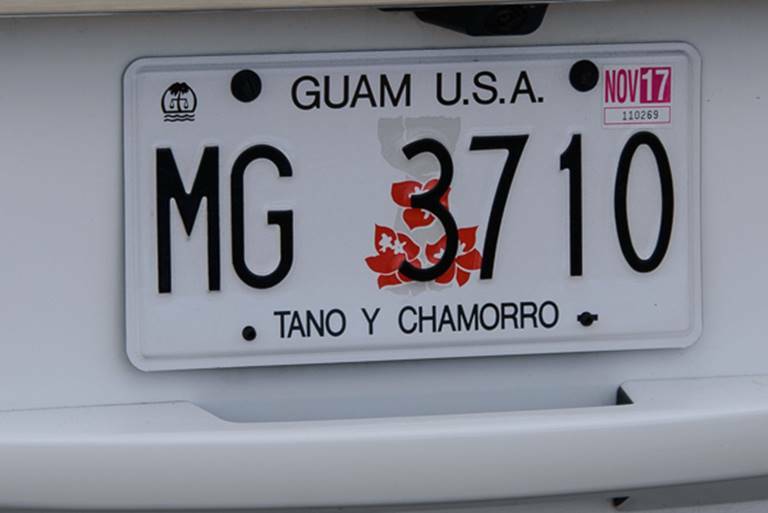 The extended family is the main social unit for most groups on Guam, although many of the younger members travel and live in the United States. The folk arts and handicrafts of Guam have enjoyed a revival since the late 20th century. Various public and private groups have been created to promote music, dance, and other traditional cultural arts for the benefit of both the local community and tourists. 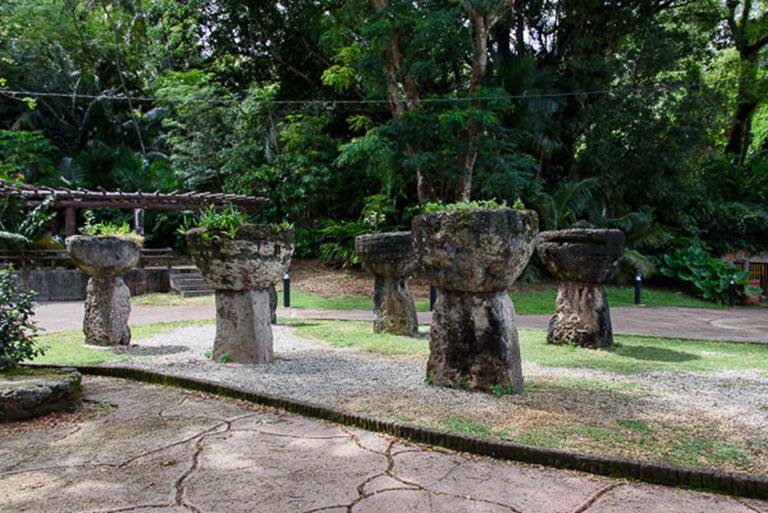 The Guam Museum, in Hagåtña, features works by visual artists from around the Pacific Islands. The University of Guam also promotes regional arts and culture. U.S. national holidays are celebrated on the island, as are several significant local dates such as Discovery Day, March 6, which commemorates the arrival of Ferdinand Magellan in 1521. There are daily and semiweekly newspapers and quarterly and monthly magazines published on Guam, and several radio and television stations broadcast local and international news and features daily. Guam, like the other Mariana Islands, was settled by the second quarter of the 2nd millennium BCE by an Indonesian-Filipino people. Archaeological research shows that by 800 CE they had developed a complex society that erected elaborate stone pillars (halege), which served as supports for communal houses (latte). Ferdinand Magellan probably landed on Guam in 1521. Spain officially claimed the island in 1565 but did not attempt to conquer it until the latter part of the 17th century. After an uprising in 1670 and 25 years of intermittent warfare, the Spanish subdued the population with considerable bloodshed. Diseases introduced by the Europeans, particularly smallpox and influenza, also played an important role in the decimation of the population. Typhoons in 1671 and 1693 caused further destruction and loss of life. Guam remained a Spanish possession until 1898, when, in the course of the Spanish-American War, the U.S. warship Charleston steamed into Apra Harbor and bombarded the old fort. Guam was ceded to the United States, and Spain sold the other islands of the Marianas to Germany in 1899. From that time until 1950 (except for the period of its occupation by the Japanese during World War II) the governor of the island was a naval officer appointed by the president of the United States. During World War II the Japanese landed on Guam just after the Pearl Harbor attack and occupied the island by Dec. 12, 1941. Allied forces retook Guam by Aug. 10, 1944. It was a major air and naval base for the squadrons of bombers that attacked Japan near the end of the war. Under the jurisdiction of the U.S. Navy, it was made a territory (1950) that was administered by the U.S. Department of the Interior. Various offices within that department have administered Guam; the Office of Insular Affairs has had responsibility since 1995. Guam remains the site of major U.S. naval and air bases; about one-third of the land in Guam is owned by the U.S. armed forces. In the 1970s Guam gradually began to move toward representative self-government. The first popularly elected governor ran for office in 1970, and in 1972 Guam was given the right to send one nonvoting delegate (entitled to vote in committees, however) to the U.S. House of Representatives. In 1978 the U.S. Senate accorded Guam the right to adopt a territorial constitution. In 1982, in a referendum offering six options, the option of commonwealth status won a plurality of votes. A draft Commonwealth Act was approved in 1987, and continuing negotiations with the United States took place through the late 20th century. Anderson Air Force Base was expanded in the 1990s, and in 2000 it became the first U.S. Air Force installation outside the continental United States to store conventional air-launched cruise missiles. In 2002 another typhoon struck Guam; it caused devastation across the island and left thousands homeless. The War in the Pacific National Historical Park visitor’s center. The visitors center had several excellent exhibits and a book store, but the highlight was a film “The Battle for Gaum” which had been edited to 10 minutes from its full 30 minutes. I plan to locate the film when I return home to watch it in its entirety. A Japanese two-man submarine. 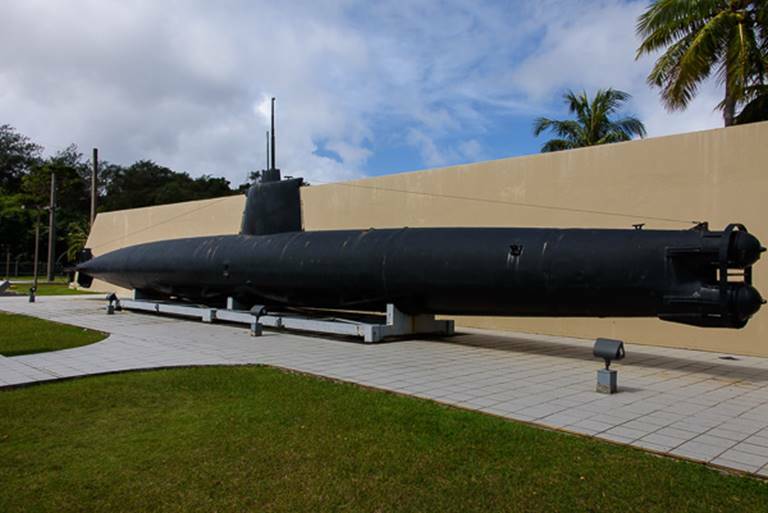 Although Japan produced over 2000 of these subs, they are credited with only sinking a single ship. The submarine is over 80 feet in length, but the crew quarters were quite limited. A view of the commercial port where the Amsterdam is docked (she is on the left next to the crane). If you have followed my blogs in the past, you might have noticed that I like to photograph the local vehicle tags. They often say a lot about the country. Latte stones. These stones were the foundation pillows of buildings. These date to approximately 600 years ago. 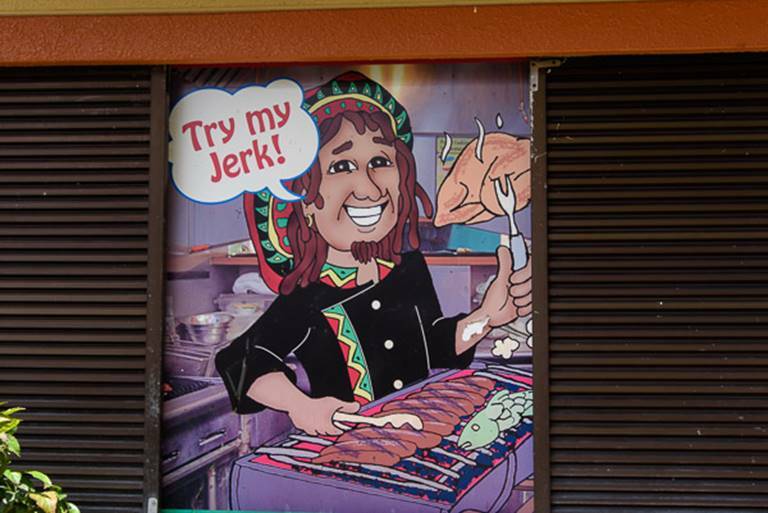 A sign at an eatery in the Chamorro market. 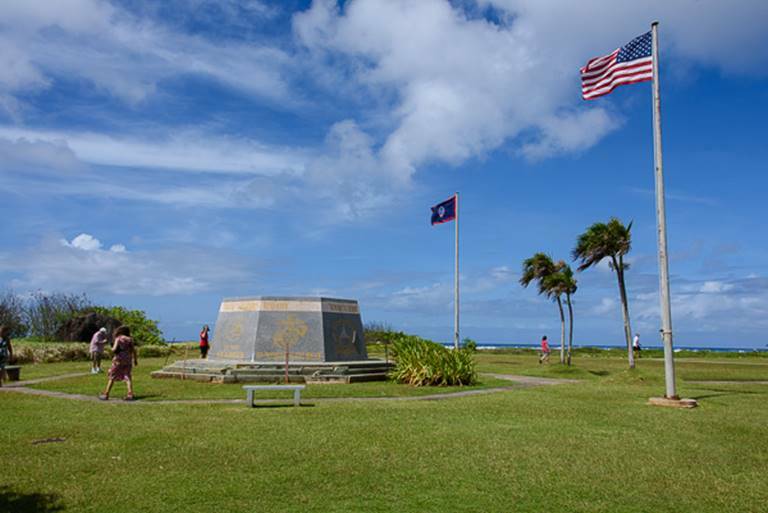 Monument at the Asan Beach Park. Asan Beach. The below description came directly from an information plaque. “Mortar shells geysered the water as thousands of U.S. Marines rode amphtraks and wade ashore here on July 21, 1944. Japanese guns swept the beach from camouflaged pillboxes at Asan Point. Landing craft continually shuttled the dead and wounded back to the ships. Sea containers were used to cordon off our area from the general port operations. Our delayed departure did allow for a beautiful sunset photograph as we literally sailed into the sunset. As I am getting ready to post this blog entry it is early Wednesday morning, February 8. 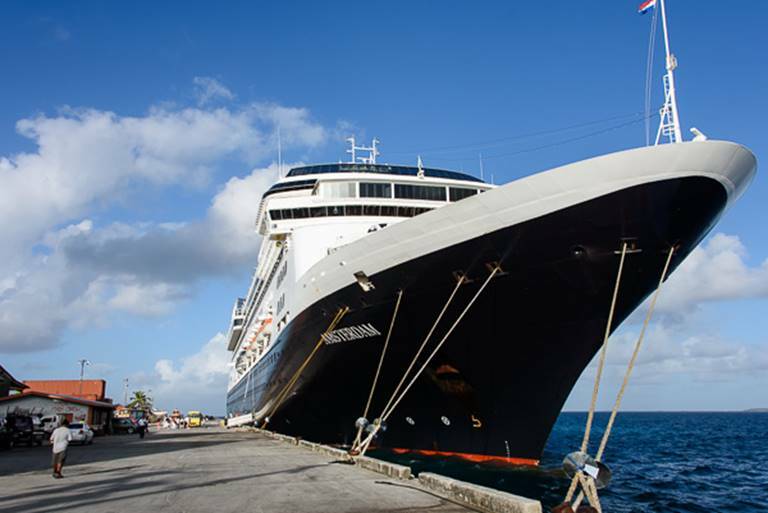 The captain has just announced that we will not be able to dock at Saipan. We have been outside the channel for the past 2 hours and the wind and surf has only increased. The port master reported that the waves on the pier are 11 feet. So… we are sailing on toward Japan. I do hate that we missed Saipan because I understand it is a beautiful port. On the otherhand, the weather is truly miserable with rain and 35-40 mph winds. 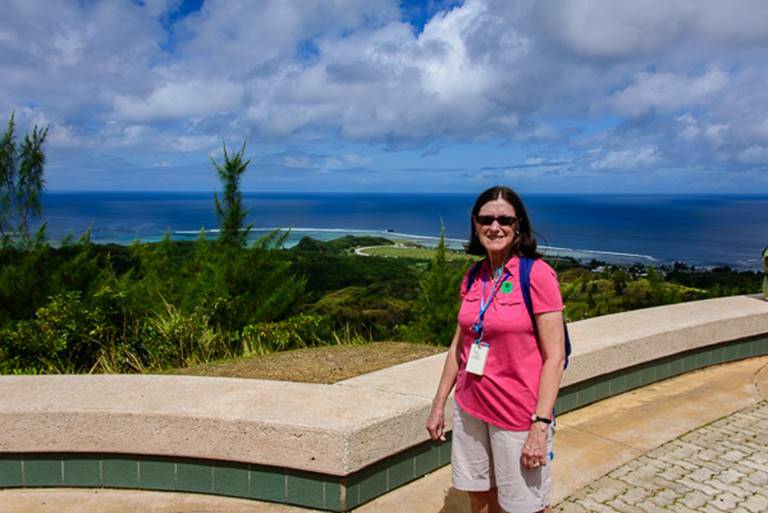 I am not sure that we could have enjoyed our day in Saipan. Captain Mercer also warned us to be careful onboard, he expects the seas to continue to be rough for the remainder of the day at least. Until next time, probably in Osaka. Finally, we reach land. After four days at sea (five calendar days, since we crossed the International Date line and lost Monday! ), I was ready to have some solid ground under foot. The cruise hasn’t been bad, in fact it has been quite smooth and the weather has been almost perfect. For some reason on this trip, I have been more prone to have idle time. Despite the many improvements in the Amsterdam since we sailed her two years ago, the cost cutting measures are apparent in the programming. 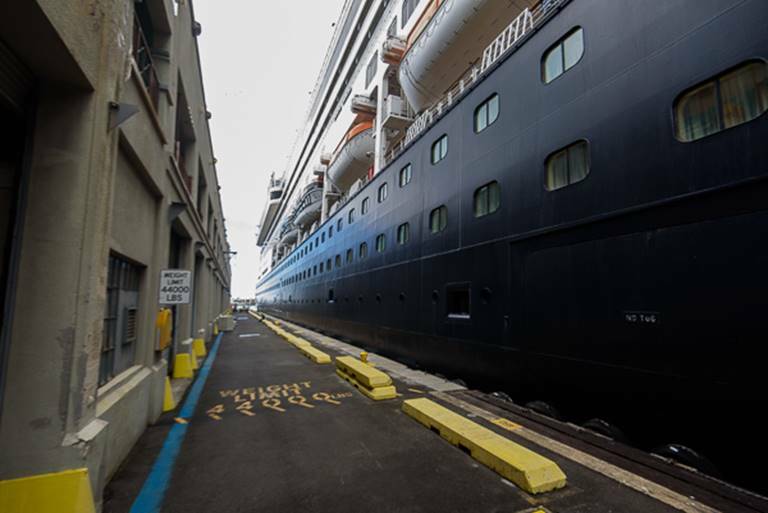 There seems to be fewer quality programs aboard, there have been no major movies to be seen and the entertainment just hasn’t been up to the level I have come to expect from Holland America. On the other hand, the food has been excellent and I have no complaints about the service. I have enjoyed catching up on reading and have been enjoying time in the gym and the thermal spa. It still isn’t a bad life folks! At any rate, we reached the Marshall Islands this morning. Sailing through the atoll channel around 6:30 AM and traveling another 14 miles to reach our pier, a commercial working pier. I have included several maps to give the reader an idea of the location of the Marshall Islands and of Majuro, the capital where we visited. Located in the northern Pacific, the Marshall Islands consist of 29 low-lying coral atolls comprising 1,156 individual islands and islets. These atolls and islands form two groups: the Ratak Chain and the Ralik Chain (meaning "sunrise" and "sunset"). The general landscape is sandy as most of these islands rise only a few feet above sea level, with the highest point being an unnamed hill on Likiep which peaks at only 32 ft. . 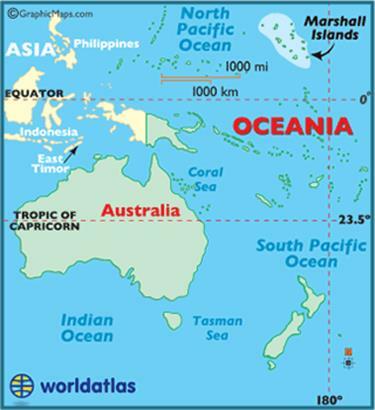 The Republic of the Marshall Islands (RMI) is about midway between Hawaii and Australia. It was first settled by Micronesian navigators, they were subsequently controlled (some say exploited) by Spain and Germany, and finally by Japan. Prior to the beginning of World War II, the Japanese fortified some of the atolls as a defensive measure. When that war ended with Japan’s defeat, the United States was given total control. For almost 40 years the islands were under U.S. administration as the easternmost part of the United Nation’s Trust Territory of the Pacific Islands. The United States used some of these isolated atolls for nuclear testing between 1947 and 1962. Long term affects are yet to be totally understood, and damage claims are still in the courts to this day. In 1986 the islands gained independence under a Compact of Free Association with the United States. Under the terms of that agreement, the U.S would provide significant financial aid, that to date now exceeds $1 billion. 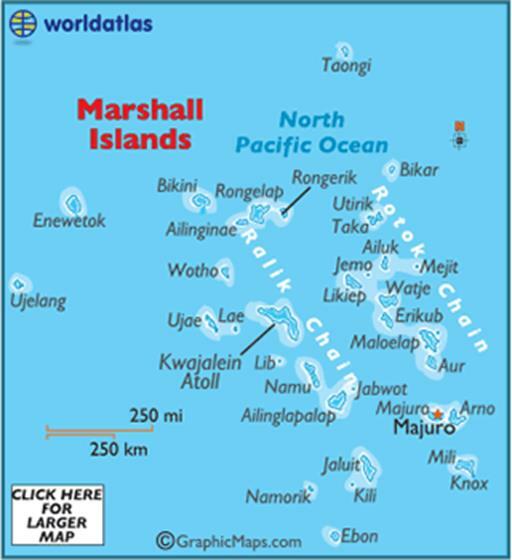 Marshall Islands population of 71,000 is spread out over the 29 coral atolls. 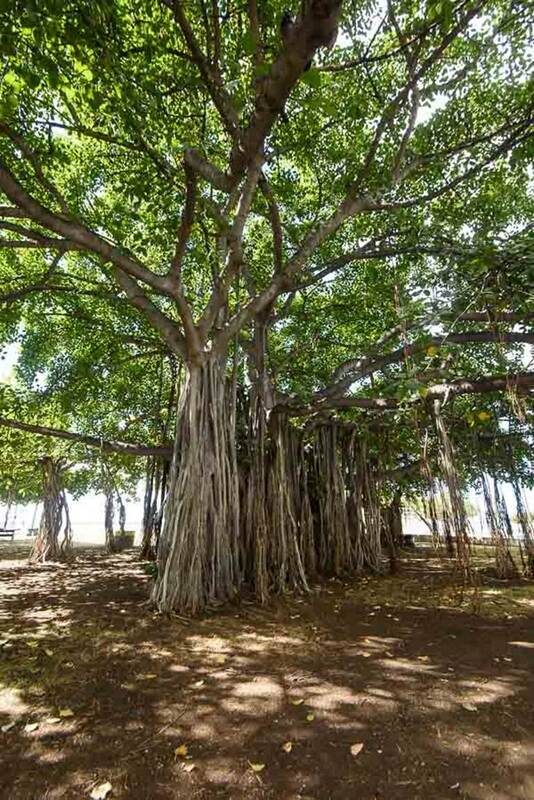 About 30,000 of the islanders live on Majuro, which contains the capital. 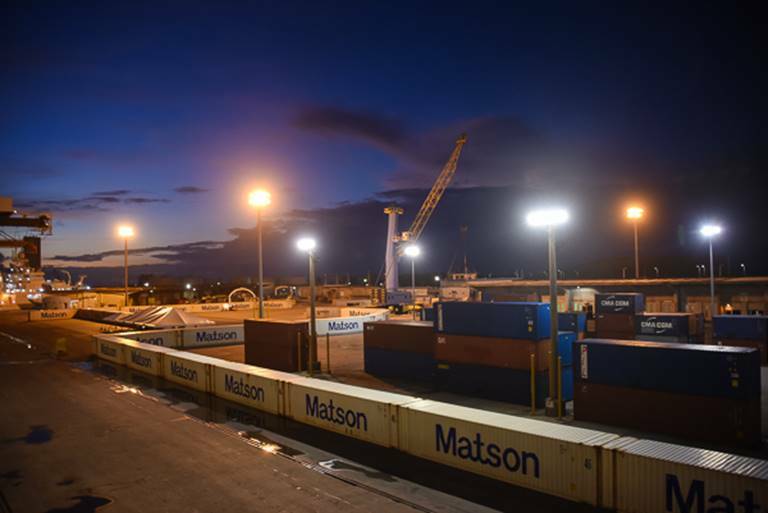 Majuro is exactly the type of port I like to visit. I realize I am the minority in thinking like this – although thankfully my fellow travelers, Kay, Janet and Carl, share this enjoyment with me. 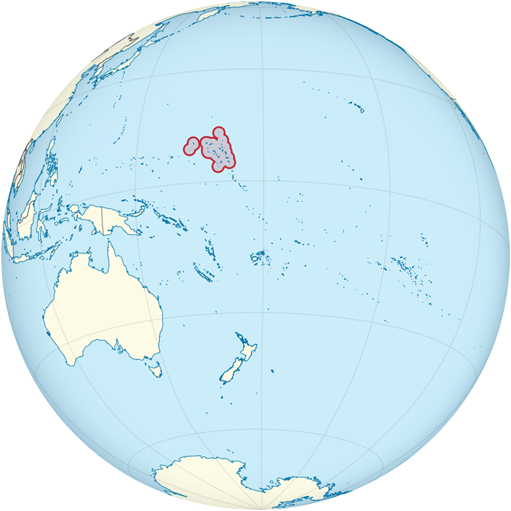 The island of Majuro is small (the entire of the 1,156 islands total land mass is only about 70 square miles). I am not sure of the size of Majuro, but we walked a considerable amount of it this morning. In places, you could stand on at the rise of one beach and view the ocean across the road on the other side of the island. It couldn’t have been more than a couple hundred feet wide in places. The Marshall Islands have very little economic industry. It is primarily a service based economy with some fishing and a small amount of agriculture. It was obvious upon exiting the ship that the infrastructure on the island suffered greatly. Most buildings were dilapidated and the streets were often in need of repair. For the most part there were no sidewalks. There were absolutely no tourist attractions. You might ask, why would you want to visit someplace like this? The answer is simple – the people. We walked the two and one-half miles to the center of town and back. This not only gave us needed exercise but allowed us to really meet the ordinary people on the street – literally. Anytime I see a pharmacy, I must visit! This is Rosemary, the pharmacist/owners’ daughter. Her father was “off island” for a couple of days. She explained that no prescriptions could be dispensed until his return. 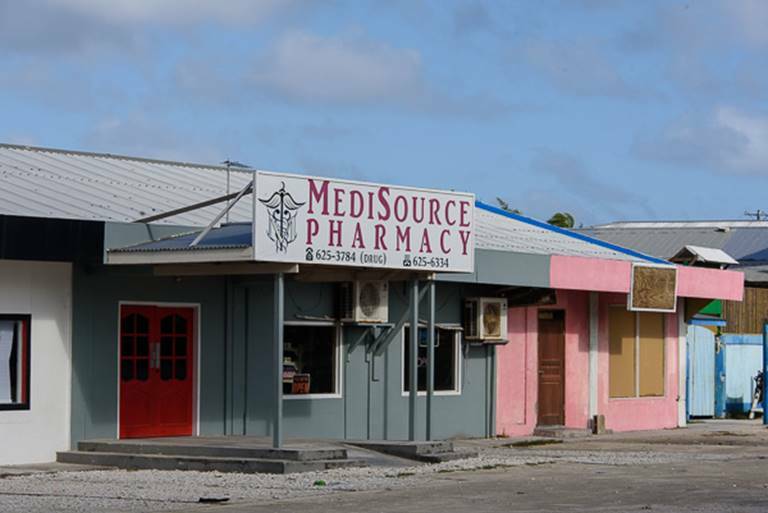 This is the ONLY pharmacy on the island other than one at the hospital. I asked what patients did while he was gone. She explained that her father would prepare regular medications for his patients which he expected they would need while he was away. The island way! These guys were thrilled to have their photo taken. Kids all over the world are the same. Everyone was welcoming and cordial. English along with Marshallese are the official languages and the US dollar is the currency in use. We were greeted by men sitting on their steps, by ladies escorting their children to school and by groups of children playing in their yards. At the library/museum in town where the ship shuttles were dropping off guests who elected not to walk (about 95%), the local towns people had erected a stage and provided local music and dancers for our enjoyment. We met a school teacher who was from the North end of the island with an 8th grade school group on a field trip to the Court House for a lesson in government. She told us that only one or two cruise ships visited the island each year, so it was a real treat for the people when one arrived. This lovely group of ladies were the dancers. They performed not only traditional Marshallese “hula” type dances, but even the “hokey pokey”. A beautiful church. 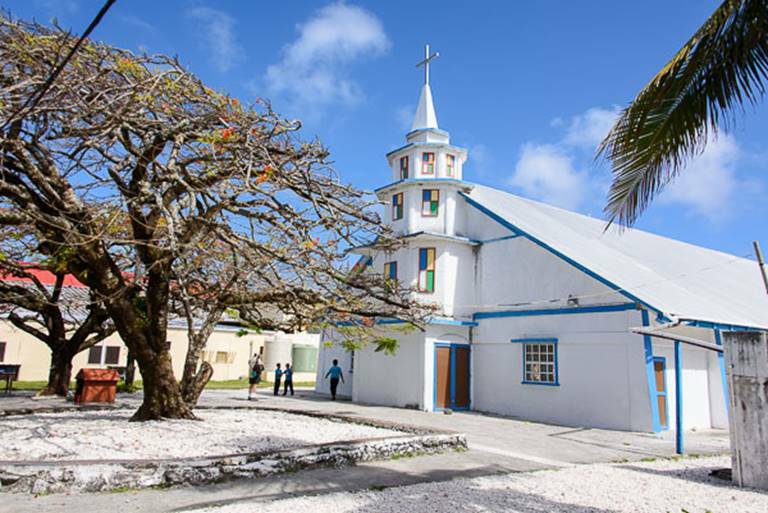 Over 90% of the islanders are Christian of various denominations. The temperature was in the mid 80’s and the humidity high. After our approximately hour walk, we decided a beer would be good. There were several markets which sold beer, but we could not find a sit-down café or bar. After asking a local, we learned that it was illegal to have an open beverage on the street. 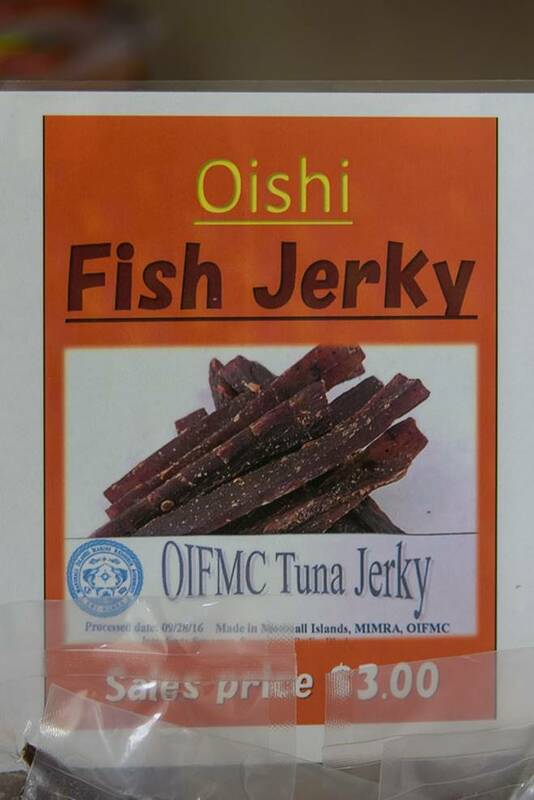 I had previously been in a market (I love to visit markets in far-away places) and purchased a local product, fish jerky – made from tuna. I tried it after returning to the ship. I liked it but I am sure it wouldn’t be for everyone! It was definitely fishy tasting. Anyway, back to the beer story. We went into the market, and the lady at the register who I had purchased the fish jerky from, said we could purchase a beer and drink in their back room, a “snack room”. Accordingly, we purchased a few beers, some chips and nuts and spent a great 45 minutes in air-conditioning and even met up with our wine steward, Ernie. 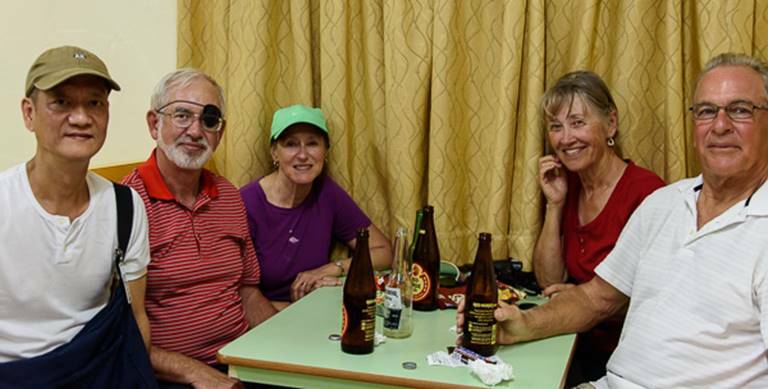 Enjoying our Philippine beer with our Philippine friend, Ernie. A couple more guys happy to have their photo taken. A view of the Amsterdam after rounding the crook of the island. We thoroughly enjoyed our few hours in the Marshall Islands. The people are beautiful, both inside and out. As Janet said at dinner this evening, she didn’t think she had ever been anywhere the people were more friendly. When you see the hardships so many in our world endure and keep a happy and optimistic outlook on life, you realize your personal problems are really quite small. 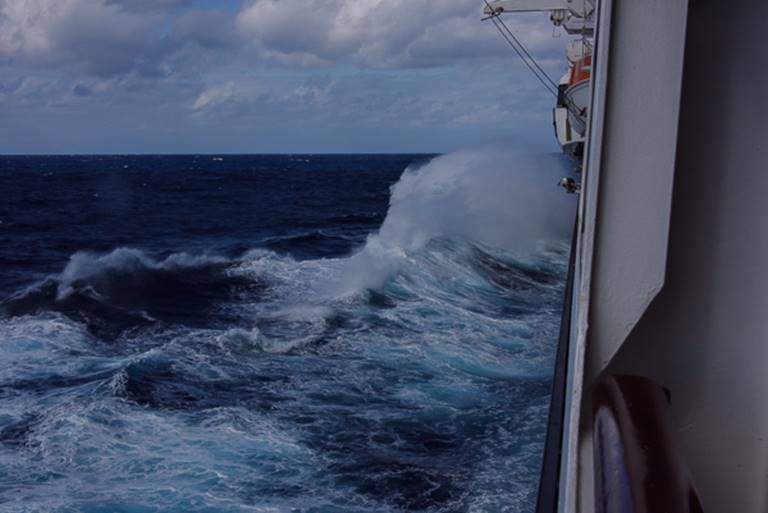 It is another four sea days and about 1700 nautical miles till our next port in Guam. I guess I will be doing more reading and work on learning CW (Morse Code). I passed my Extra Class amateur radio (Ham) license exam just before leaving on this trip and my next goal is to master, at least some, CW. At least I am a captive audience! Again, due to internet service, I am not sure when my next post will be. You may have noticed that I show only 3 days for this post, the 13th-15th, but four calendar days, Saturday-Tuesday. I am writing this at 6:00 AM on Tuesday morning but when I retired to bed last night it was Sunday night! We crossed the International Date Line and effectively Monday the 30th never existed for us aboard the Amsterdam. The good news is that we will get our day back as we travel again by air from Hong Kong to the US and re-cross the line in the easterly direction. 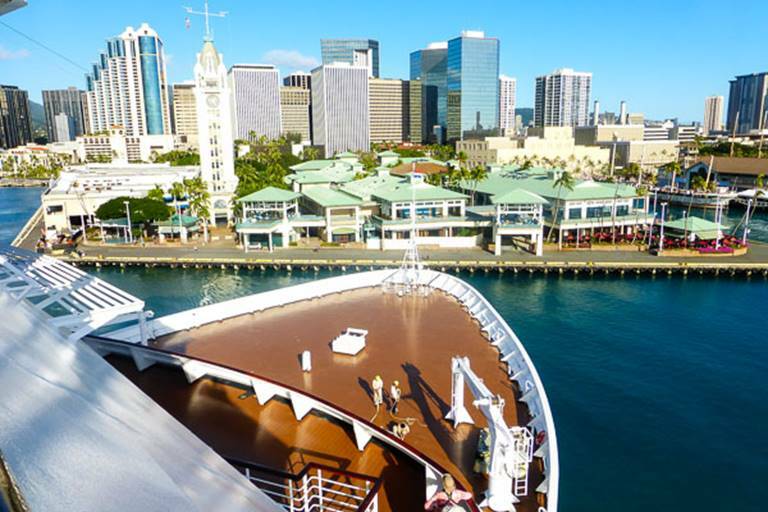 We will have a total of four days at sea to reach our first port since Honolulu. We are scheduled to arrive at Majuro, Marshall Islands on Thursday the 2nd. We continue to meet old friends and acquaintances. Last night we visited with Pauline and Mike Hall who we traveled with in 2011 on the Grand South American cruise. 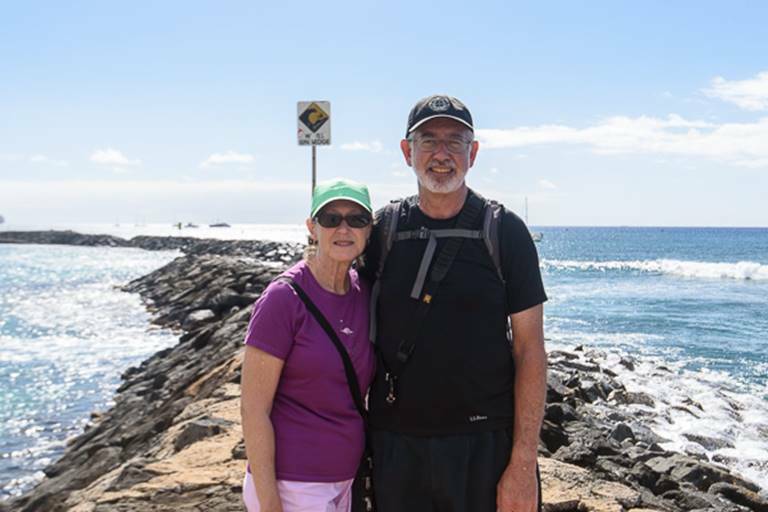 Pauline and Mike have been very active travelers since our last cruise together. I enjoyed a relaxing day on Saturday; reading, eating, taking in two lectures, walking a bit, spending some time in the thermal spa and taking in a show in the evening. Wow, when I write it down, it doesn’t sound too relaxing! The first lecture presented was by Dr. George Losey from the University of Hawaii. The topic of his series is Micronesia, Melanesia and Polynesia – Their Origins and Discovery. Dr. Losey is a very engaging and interesting speaker. I look forward to his additional lectures. He will be on board until Guam. The afternoon lecture was by Dr. Mark Lax from Australia. The topic of his series is: Captain Cook’s Third and Final Voyage. I found the information presented very good, but Dr. Lax ‘s presentation was not as engaging as the morning lecture. Since I have attended several lectures about Captain Cook on previous cruises and read extensively about his travels, it remains to be seen whether I will complete this series. I had a wonderful grilled fresh-catch blue marlin for dinner. I just can’t pass up all the wonderful fish which are offered as a choice each evening. Yesterday (Sunday) was also an easy day. Following our routine of breakfast in the dining room, we attended what used to be the “Good Morning Amsterdam” program which is now called “Coffee with Gene and Jessica”. This is a 30-minute program which is very informal and often one or two guest are present. They may be entertainers from the previous night or members of the crew. It is usually a fun way to start the day. Mark, the assistant cruise director who is the man behind the scene, gave a presentation regarding the new online navigator. It is really a very nice addition which allows you to check out what’s happening on the ship. The idea is to reduce the amount of paper generated, “going greener”. The idea is good, but there is just not as much information as used to be supplied in the paper Navigator. To make matters worse for someone like myself who blogs or simply wants to look back on past events, once today is gone – the information about today is gone! I plan to bring this to Mark’s attention and see if the information might be left on the website. The usual day of a little exercise in the gym, and hour in the thermal spa, read a lot and finally another great dinner, Surf and Turf with all the trimmings. I had what I believe to be the best Key Lime Pie I have ever had. It was superior to any I have had on Key West. The show tonight was a presentation by the Ship singers and dancers. They did a great job. It was very entertaining. Sorry there are no photos, but not really anything to photograph. I hope to have some good photos to post when we reach our first port. Oh, the internet here in the Pacific is poor. If I don’t get it early in the morning, I can’t get it at all. If you don’t hear from me on a regular basis, please know this is the reason. Today was our first full day aboard the Amsterdam. It is amazing how quickly I fell back into my shipboard routine. Having spent over three months aboard this ship previously certainly made the transition from land to sea easier. Since the ship was in port today, breakfast in the dining room began at 7:30. Since we are all early risers, we were there at the open. Our servers were efficient and attentive as we have come to expect on the Grand cruises, but it took an extraordinarily long time to receive our food. We hope this is just an anomaly. 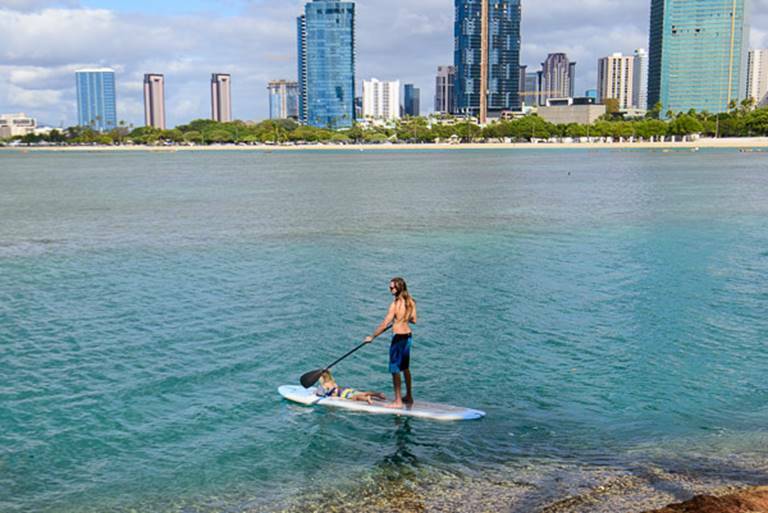 Since we have been in Honolulu for several days we didn’t have any “excursions” planned. 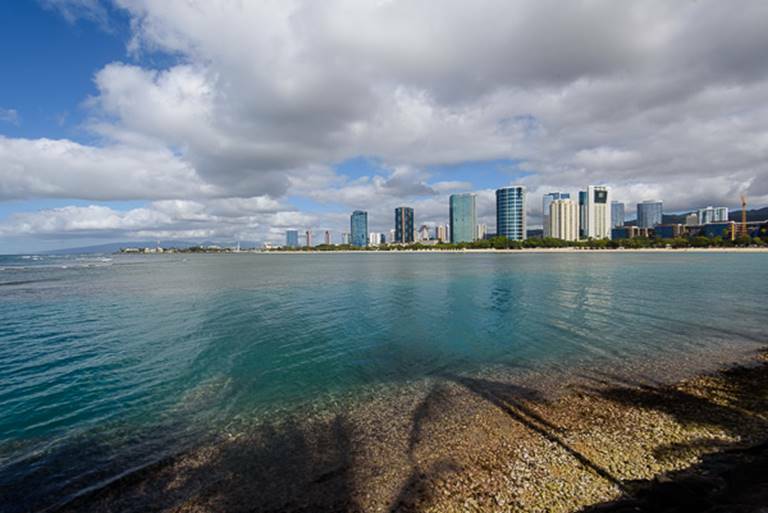 We decided to walk the approximately two miles to the Ala Moana Beach. View back to the beach from the park area. 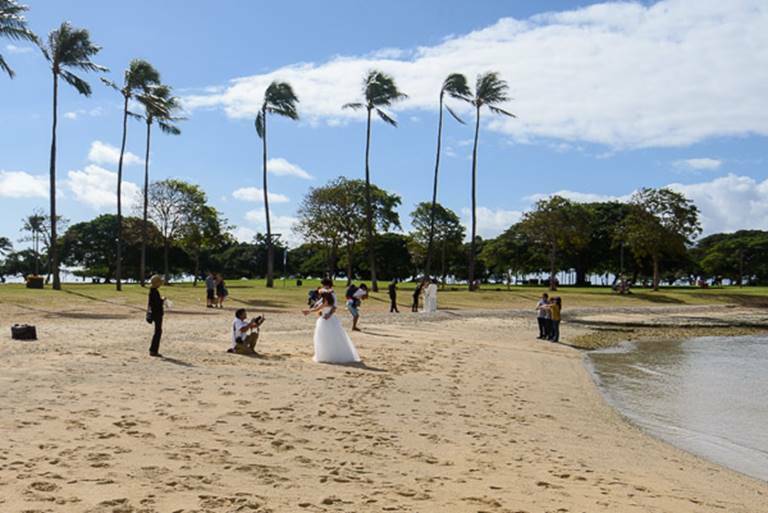 Preparation for a beach wedding. A father and daughter spending quality time together. Kay and I at a breaker. Carl has us covered! Doesn’t this make you feel safe? 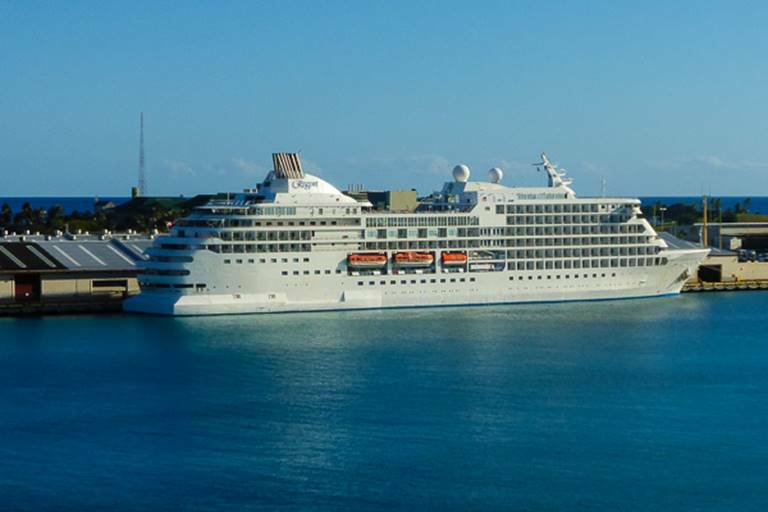 Regent Seven Seas on their World Cruise. Our friends, David and Lea Jarvis are on this cruise. 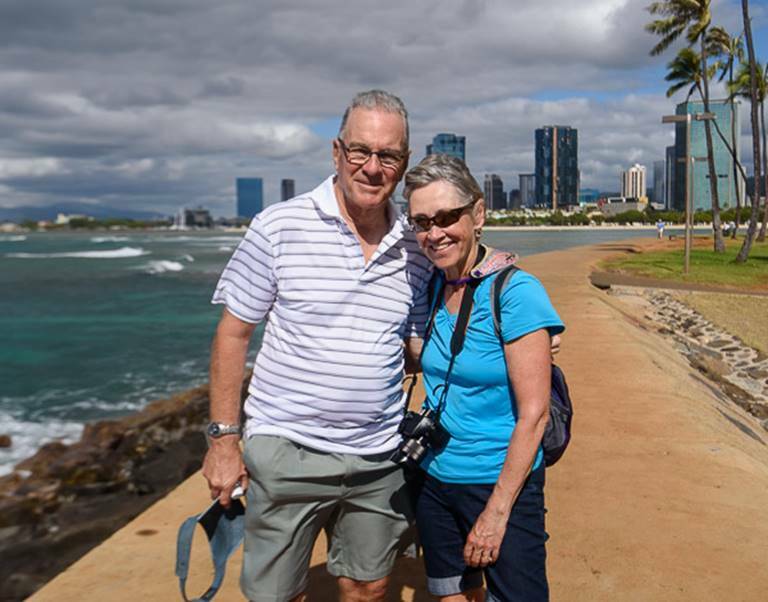 We had hoped to meet up while our paths crossed here in Honolulu, but their arrival was delayed for several hours due to bad weather during their Pacific crossing from the mainland. 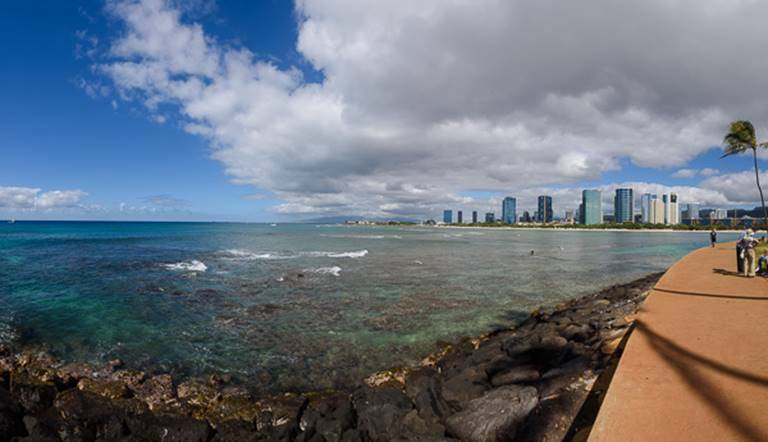 Our departure from Honolulu. This photo was taken from the deck outside the thermal spa. We arrived back at the ship before noon and enjoyed our lunch in the Lido. A number of improvements have been made on the ship since we sailed her two years ago. The Lido seems to be more efficient with more service. Previously I tried to avoid eating at the Lido as much as possible but on this trip, I can foresee taking more lunches here. I enjoy sushi again, it makes for a great light lunch. After a brief rest after lunch, it was time for the mandatory lifeboat drill prior to beginning our trip. Following the drill, Carl and I made our way to the thermal spa which is an incredible way to relax after our almost 10 miles of walking. Dinner this evening was fantastic! I started with tuna tartar and deep fried sharp cheddar cheese. I followed this with a cucumber-tomato chilled soup. Remarkably, all four of us selected the same main tonight, grilled fresh caught spearfish with vegetables. I finished up with blueberry cheesecake and coffee. Glad I walked the 10 miles today! There was no live entertainment in the Queen’s Lounge tonight, but we did watch a movie on the big screen, “Amelia”, a documentary about Amelia Earhart. We have four sea days before reaching Majuro, Marshall Islands. There was no hurry in getting up this morning. I had requested a late check-out since our shuttle service was scheduled to pick us up at noon for transportation to the ship. We had a leisurely breakfast at Denny’s just down the street from the Waikiki Beach Walk. This is probably the best deal for a meal in all Waikiki. I don’t believe I have mentioned the cost of food in Waikiki. We canvassed several markets in the area and the average price for a gallon of milk is $12.00. A dozen eggs are $6.50. Not everything is so expensive though. Beer and alcohol are similarly priced as on the mainline. The best fresh pineapple you have ever had is about a third less than the mainland. Fresh sushi is also a bargain here. Our ride arrived right on time and we were at the Pier by 12:15. While waiting to go through security with our bags, I heard someone call “Mr. Abernathy”. To my surprise it was our wine steward, Ernie, from two years ago on the world cruise. He was just returning from shore leave and had to pass thru security too. I was surprised he recognized me. This was only the first of many old friends we were to meet today. Gene, the program director, was just inside the gangway to greet us and welcome us back again. Our wonderful friend and Assistant Dining Room Manager, Presty was also there to greet us. At dinner tonight we were able to spend time catching up with Presty and Ernie who is again our wine steward. Ali, who was one of our dinning stewards in 2015 was also there, but unfortunately, we are not in his section this time. Don Gurschow, both Presty and Ernie asked about your health and said they were looking forward to seeing you soon on your cruise. By the way, Presty arranged for us to occupy you table from your last cruise. He really takes care of the Soleil folks. Following a wonderful dinner this evening, Kay, Janet and I started with goat cheese topped with caramel onions with cloves. The girls followed this with celery and ham soup and grilled skewered mahi mahi. They said it was delicious. Carl and I had a main of Korean short ribs. They were also delicious but too much food. Along with my goat cheese, I had one of my favorites, a cool fruit soup, melon and cucumber. Carl accompanied his ribs with a Caesar salad and the celery and ham soup also. Of course, we all had deserts. Too Much Food.